The Supreme Signs enjoins man to ponder on the purpose and wisdom for man’s existence. 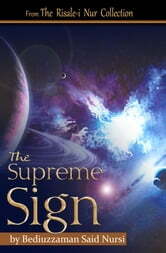 It points to the whole universe and the life of man as “signs” by which to recognize the Creator. According to these “signs” man’s primordial duty is to know God, to believe in Him, and to worship Him alone. Magic, White and Black, or the Science of Finite and Infinite Life, Containing Practical Hints for Students in Occultism.